The Ozeri Touch Professional Digital Kitchen Scale is part of the new range of kitchenwares from Ozeri. Ozeri is well-known in the USA but they have only just started to sell their products here in the UK and the range can be found on Amazon. 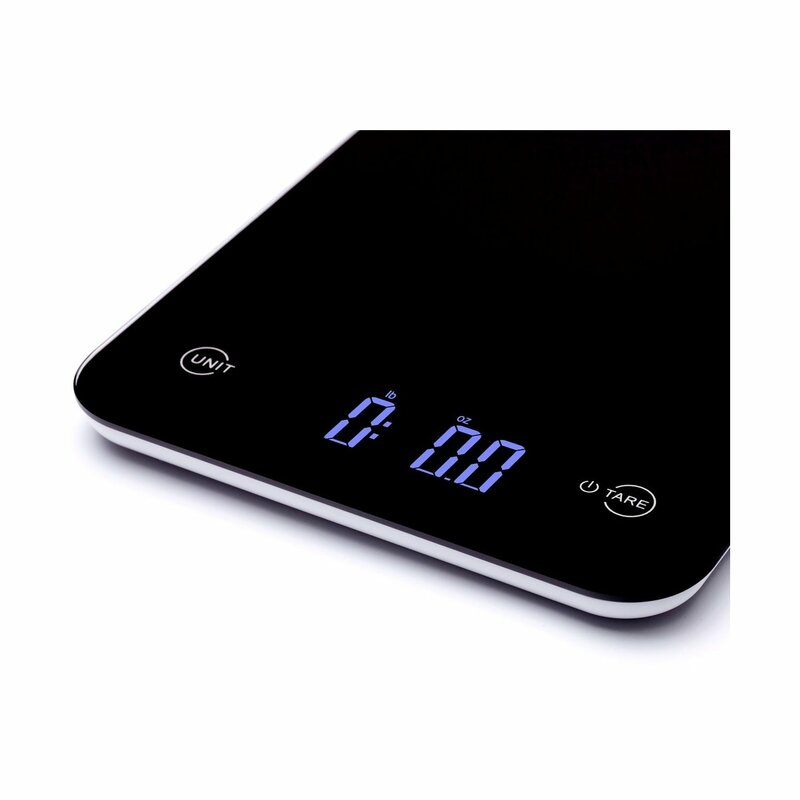 There are a number of features of the Ozeri Touch Professional Scales which are perfect for me because I spend a lot of time cooking with my children. The surface of the scale is made from smooth tempered glass which means there are no little nooks and crannies for flour, sugar and other bits of food to get stuck (this is what caused my old kitchen scales to die!). The smooth surface also makes it really easy to wipe clean after a chaotic cooking session with my girls. Quite apart from the practicalities of the tempered glass top, I think it looks stunning and the whole jet-black, sleek style fits perfectly in my modern kitchen. The numbers and display are very bright and large which makes it easy for my preschooler to read the digits, far easier than any other scale I have used before. There are two buttons on the front. The first button changes the unit of measurement (grams, pounds and ounces, fluid ounces and millilitres (yes my husband did try out the ml measurements to make sure they told the truth!!!). The second button is labelled TARE which is described by the manufacturer as the ability to automatically deduct the weight of the container you are using which is slightly over-egging the functionality... basically this button resets the scale to zero, even if you have something already sitting on the scale. I was also impressed by the range of weights that the Ozeri scale can measure - upto 5050g which means there are few things I normally cook that I wouldn't be able to weigh on the scales, even in my heavy ceramic mixing bowls. I would say however, that for a full-sized mixing bowl, the surface of the scale is relatively small compared to the bowl but at least the scale is compact (about 23cm by 15cm all told, and less than 1.5cm thick) so it takes up very little space in my kitchen. 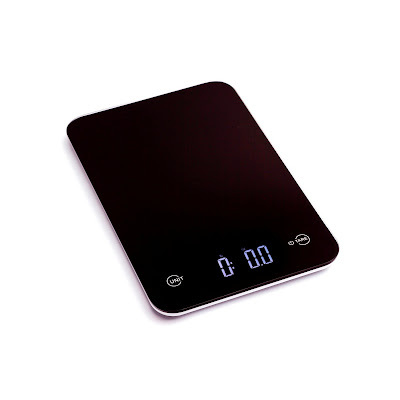 Overall I found these kitchen scales to be smart, compact and easy to use and I will definitely be checking out the other products from the Ozeri range. The Ozeri Touch Professional Scales have a RRP of £29.99 but are currently available on offer at Amazon.